It’s more nuanced than you think. Last week at Google I/O, one of the striking themes of the keynote was Sundar Pichai’s focus on Android as the future of Google. Android isn’t just the core of Google’s booming smartphone and tablet business; it’s also core to the company’s next phase, as they move into what Pichai described as “connected devices” or the internet of things. He imagined a world of hardware devices that do everything from monitor traffic to track your heartbeat, all brought together by Google’s prize operating system. Let me just untangle for you what that really means. The data giant that pretty much defined the idea of Web 2.o back at the turn of the century is redefining itself as an OS giant. As the cylons would say, all this has happened before and will happen again. Back in the late twentieth century, Microsoft dominated the market for computers by focusing largely on its still-wildly-popular operating system, Windows. Sure, it was always being challenged by Apple’s OS — just as iOS challenges Android now. And there was the Linux incursion. But Microsoft won that battle for several reasons. First, it was hardware agnostic. Like Android, Windows was designed to run on many kinds of desktop computers. And their software, like Word, was equally agnostic. You could run Word on an Apple machine (indeed I did, as a college student with my nifty Mac Quadra). Similarly, Google apps are now being made ready for the iOS environment. By making Windows as portable as possible, Microsoft was able to own the software market. They turned the desktop computer ecosystem into a Windows ecosystem. Indeed, that ecosystem persists to this day, all over the world. Net Applications, a market analytics firm, estimates that Windows is installed on 91% of desktop PCs worldwide. But Apple finally figured out a way to make its most limiting feature a boon. Instead of designing an OS for a small, elite family of PCs, the company went into consumer electronics. With the iPod, the iPad, and the iPhone, the company could finally smack Microsoft around. They didn’t need to make their software portable to all devices, because their devices were the lure. And that’s where Android comes in, with its operating system challenge, like the return of the repressed. Android even sidesteps the Linux threat, by simply incorporating Linux (perhaps ineptly, as many developers will quickly point out, but effectively). 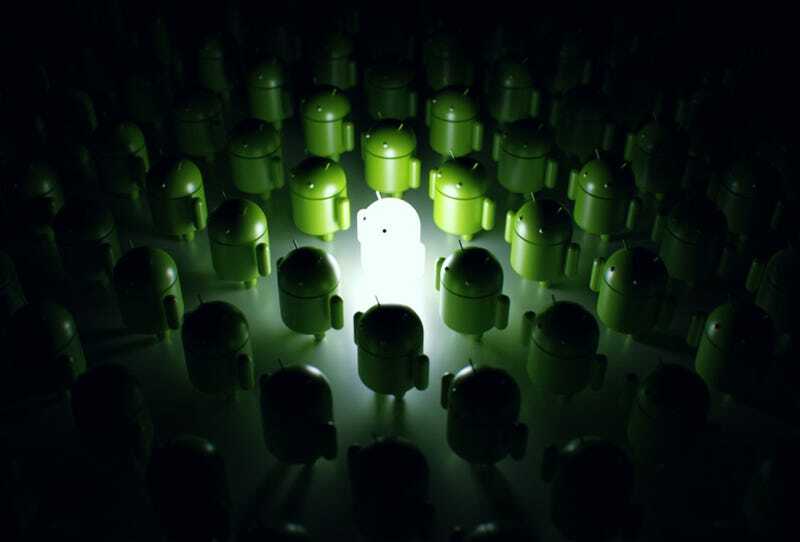 Now that mobile devices are the thing, Google hopes to dominate that market with an operating system to rule them all. Still, there are many differences between what Android is trying to do and what Windows did last century. First of all, Android devices will ultimately be far more diverse than desktop PCs. They might one day be part of urban infrastructure, as well as your car and your smartphone. And even though Android is a powerful OS, the goal for Google has always been to rule the cloud. So we’re moving from a Windows world of smart devices in a relatively dumb internet, to dumb devices in a smart cloud. Because of course your Android device is not much use (and not much fun) if it can’t network with your personal data in the Google cloud — as well as everything else that’s online, too. What this change underscores is how much you and your data are key to Android’s value. Desktop PCs were great for organizing and accessing your data. But mobile and infrastructure devices are also for generating data. The more you use your devices, the more information it gathers about you, and the “better” it gets. That’s what has led to so many improvements in Google Now, as well as countless other apps that track everything from pedestrian patterns in malls to rodent life in forest ecosystems. That’s right: You are part of the gadget. Android is you. Back in 1994, when I was just becoming aware of computers as something other than the thing I used to write papers and send email, Bill Gates published a kind of futurist manifesto called The Road Ahead. I remember picking it up in a Barnes and Noble, laughing at its cheesy cover, and trying to determine what the figurehead of The Most Evil Company In The World had to say about my future. Mostly, as far as I could tell, it was about the “World Wide Web” and browsers. Those were the early days of Internet Explorer, and Gates was preaching about how tomorrow would bring us many internet marvels — something that was already obvious to me, but probably not to my elders and the many users of Windows. Back then, the future was the web, and it gave birth to a thing called Google, which has come to rival Microsoft in its power — and its ability to set the agenda for our technological future. Now Google says the future is the operating system. We have come full circle — or, more accurately, we have looped around the spiral and returned to the operating system with a slightly different perspective. The device ecosystem may be different, and the data may be bigger, but the goal is the same. Microsoft and Google want to create platforms that control the information machines of the world, for better and for worse. As PCs slowly wither away in importance, connected devices will take over — leaving Android to inherit the kingdom that Windows will lose.